10 | November | 2007 | Kris Johnson's Blog…sort of. Scenario: Schläfrige Höhle”Schläfrige Höhle” (which translates roughly to “sleepy cave”) was the title given on the sign-up sheet for the game, though I suspect that Evil Mike changed the actual adventure at the last minute. If you (like me) aren’t a Robert E. Howard fanI have nothing at all against Robert E. Howard; I’ve just never read any of his novels., you may not be familiar with Solomon Kane. Fear not! Wikipedia has a very informative entry about the character. In a nutshell, he’s a gun-slinging, sword-wielding Puritan bent on vanquishing evil in 16th century Europe and Africa. Sounds like he’d be fun at a party, right? Erlich Goettler (played by me), a German woodsman who wields a two-handed great ax. Montigue Bonet, a former thief. The Frenchman wields a short sword and an intense curiosity. Richard Pettijohn (played by Gus), an English bowman. Enigo de la Vega, a rapier-wielding Spaniard. Joseph Smith, an English hunter armed with a mighty blunderbuss. Sven Jammerhagen, the mighty Norwegian whose two-handed sword deals death with every blow. After an adventure in Germany’s Black ForestWas there cake? No. I do not believe there was cake., the heroes travel to the English farming village of Chelsea. Enigo has his rapier sharpened by the town blacksmithI swear that is not a euphemism. while Sven and Erlich quench their thirst at the local tavern. Meanwhile, Montigue and Joseph seek forgiveness of their recent sins at the local church. The priest and the blacksmith reveal that several of the townsfolk have disappeared in recent months, apparently vanished without a trace while working in the fields outside the walls of the town. Enigo and Richard visit the sheriff, an elderly man clearly unsuited to deal with these mysterious disappearances. The sheriff asks Enigo and Richard for their aid, and they agree, recruiting the remaining party members to the cause. Though it is already dusk and they learn that all of the apparent abductions have occurred after sunset, the party decides to investigate the cornfields, enlisting the aid of the sheriff’s honorary deputy, though he is only willing to assist them after assurances that he will be protected and no small amount of intimidation. As they travel to the fields, the deputy relates the legend of Jack Harrison, a warlock who was supposedly burned alive in those very fields by French marauders who sought to destroy Chelsea’s mint. The deputy’s tale is scarcely finished when the party stumbles upon three mutilated corpses, who the skittish deputy identifies as Mr. and Mrs. Johnson and their young son.Hmm. That’s a little unsettling. The sharp-eyed Montigue spots something unusual on one of the bodies: fresh pumpkin seeds, still wet and covered with pulp. Eying the nearby scarecrows, Sven marches into one of the fields with Montigue following close behind. As Sven nears the scarecrow (whose head is not, as the Norwegian suspected, a pumpkin, but a burlap-covered bundle of straw), the horrible hodmedod comes to life, pulling a scythe from behind its back! Montigue steps around Sven and delivers a quick blow with his sword, rendering the scarecrow to little more than tattered burlap and scattered straw. Enigo runs to assist and the very ground seems to come alive, a hulking creature with a glowing pumpkin head rising from the soil to strike at the Spaniard. As quickly as the creature appeared, it is gone again, melting into the cornfield without a trace. “Pumpkin Jack!” the deputy cries, seeing the enormous being with its glowing head. The nervous little man faints dead away and his lantern goes dark. Richard Pettijohn readies his bow and sends an arrow through the air toward another scarecrow, while two more of the animated creatures—these, like Pumpkin Jack, with orange gourds atop their shoulders— advance on Joseph and Erlich. The creatures are quickly dispatched, but Smith is unable to accept that they were animated by supernatural means; surely, the hunter says, the scarecrows were carried by bandits who fled into the darkness when the straw men were destroyed by arrow, sword and blunderbuss.Smith has the Doubting Thomas Hindrance, which was played quite nicely by his player. Once assured that the immediate threat has been vanquished, Goettler and Jammerhagen examine the tattered remains and discover strange gold coins, which Bonet identifies as having been minted at precisely the time when Jack Harrison was said to be burned alive in the fields. The deputy notes that the mint is nearby, through the woods at the edge of the field, but Pettijohn insists that the body of the young boy be returned to the village before the party continues to the mint. The deputy volunteers to carry the body back to the village, allowing the party to carry on toward the mint, and perhaps the warlock. In the dark forest, the adventurers hear strange noises that they are unable to identify. 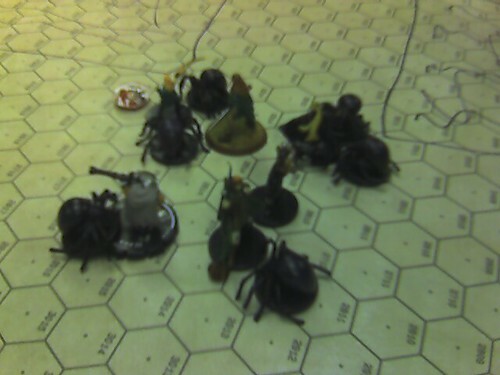 Without warning, eight massive spiders descend from the trees and, after alighting on the forest floor, ensnare several members of the party with their webs. Soon, swords are swinging once more, some with the purpose of cutting away the sticky webbing, others with the intent of destroying the attacking arachnids. In the heat of battle, Joseph Smith’s mighty blunderbuss misfires, sending a shot directly at Enigo de la Vega. 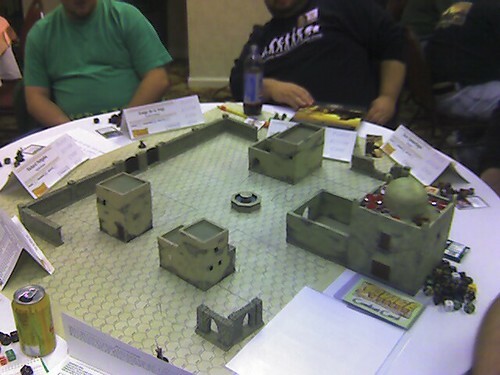 Acting with near-preternatural speed, Sven Jamerhagen throws himself into the path of the blast, taking a near-fatal shot that would surely have killed the smaller man.During this game, we made use of the Savage Worlds Adventure Deck. Each player began the game with a card that could alter the course of events at some point of his choosing. In this particular instance, I was holding the “Noble Sacrifice” card, which would allow me to take all of the damage dealt to one member of the party standing adjacent to me. Unfortunately, Erlich and Enigo were not adjacent to one another. Fortunately for Enigo, players are allowed to trade cards with one another and the hardy Norwegian was standing next to him. Sven’s player and I switched cards and Enigo was spared from death, much to the dismay of Big Mike. Erlich’s massive ax swings again and again, first freeing the woodsman from the sticky silken strands, then smashing two of the spiders. Steel blades flash in the light of the waning moon and soon the eight-legged horrors are all dead. In the aftermath of the battle, Erlich heals two of his companions’ minor wounds, but is unable to repair any of the damage done to Sven Jammerhagen by the mis-fired blunderbuss. Despite his wounds, the Norwegian presses on, unwilling to rest until the malevolent spirit that terrorizes the villagers has been defeated. When the adventurers arrive at the abandoned mint, they are met by none other than Pumpkin Jack himself. The pumpkin-headed warlock mocks the men, unwittingly revealing a weakness that the sheriff’s deputy had either forgotten in his retelling of the tale or simply did not know: magic weapons that the warlock himself forged.This was an exceptional bit of cooperation by Joseph and Montigue’s players, who played a combination of adventure cards that resulted in the villain running off at the mouth and revealing his weakness. Each player can play only one adventure card per game, so the timing on this was perfect. Montigue slipps into the mint, hoping to find one of the weapons hidden within, while Erlich, Joseph, Sven and Richard prepare to do battle with Pumpkin Jack. Enigo, who did not approach the mint with the others, wheels around when he hears a noise behind him. 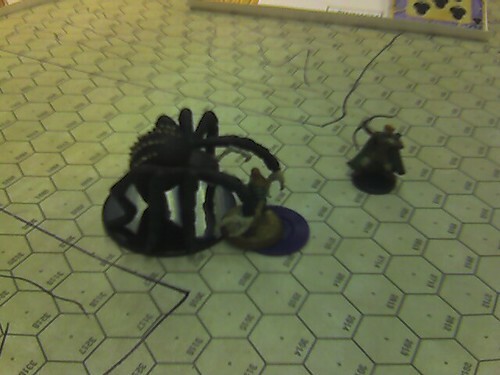 A monstrous spider, easily ten times larger than those the men fought in the forest, is bearing down on him! The swordsman turns tail and runs, shouting a warning to his companions as he leads the giant arachnid directly toward them. Sven Jammerhagen, faced with horrors beyond his ability to comprehend, flees Pumpkin Jack’s glowing visage and finds himself instead locked in combat with the massive spider. Though he is severely wounded, the Norwegian still wields his sword skillfully, cutting the beast down even as two more trundle out of the woods. Meanwhile, Montigue has located precisely what he sought: a finely forged French rapier hidden in the mint. Drawing the blade, the former thief races back into the fray and finds his hopes realized as the enchanted sword deals incredible damage to Pumpkin Jack, where Enigo’s efforts with his own rapier had proven ineffective only seconds earlier. Weakened by the eldritch energies coursing through the French sword, Pumpkin Jack is destroyed by a blast from Joseph’s blunderbuss. Its master slain, the remaining spider attempts to flee back to the safety of the woods, but is cut down by Sven’s mighty sword. Evil vanquished, townspeople safe once more, the six adventurers once again resume their journey on the Path of Kane, not knowing where N’Longa will send them next, nor what horrors they’ll face once there. If it’s not immediately obvious, this game was a blast to play. Evil Mike was a great Game Master; he kept things fast and fun, rewarding players when they did something particularly clever and punishing them when they were playing Enigo.Evil Mike and Allen (Enigo’s player) were well acquainted, and Evil Mike apparently had a history of killing Allen’s characters. Under some circumstances, targeting one player for death might seem…well, dickish, but I think everyone at the table would agree that it was done in such a way that it kept the game fun and didn’t take away from anyone else’s (or even Allen’s) enjoyment of the game. Having witnessed the Savage Worlds combat system in action earlier in the day, it was great to get the opportunity to dive in and give it a go myself.